The diary is the ‘central core’ of the software, this is where most of your time using the software will be spent so it is worth taking a few minutes to go through the available options and learn what each option does. The diary can be broken down into four key areas. (1) The main diary, this is where your food and exercise will be listed. (2) The top search box, the primary method of adding food and exercise to the diary. (4) The side menu block, this menu lets you update your weight and view results. The main diary section lists the products you have added to your diary. The current diary date (1) is shown to the top left, anything you search for and add will be added to the current diary. The arrows before the date (5) can be used to change the diary date so you can add products for different dates. In the top right of the diary you can see how many calories or kilo joules you have left (2). This is explained in more detail later in the help document. Meal names are used to break your diary into sections. Clicking the blue arrow (3) will show or hide (collapse) the items in each meal name. When a meal is collapsed a summary of the calories used is added to the meal title line. To quickly change a products meal selection simply drag it into another meal or right click on the item and select the new meal name. The +/- buttons (4) can be used to quickly increase and decrease the quantities of the product you have in the diary. Right clicking the main diary box (or in the Mac version ctrl-click) provides a quick way to change a products meal title, to copy entries to another user on the same computer or to access the edit functions. Double clicking on an entry will automatically open the products edit screen. The main search box (1) lets you search for food and exercise. The box will automatically clear the ‘What would you like to add to your diary?’ text when you start typing. Simply enter the product name you would like to add and either press your return key or click on the search button (3) to start your search. The ‘Favorites’ / ‘Favourites’ button (2) will bring up a new window where you can quickly select from a list of food products you have added in the past. At the bottom of the diary window you will see the progress box. This is subdivided into three sub sections. Section 1 lets you know how you are using your calories or kilo joules and how many you have left. Section 2 gives you a breakdown of your nutritional profile. Section 3 shows your target nutritional profile. If you would like to change the target nutritional profile click the small spanner icon (4). To hide the progress box, click on the arrow icon (5). If you would like to view progress in grams click on any of the totals. Click the totals again to swap back to percentages. Tip: If you have added exercise to the diary the ‘remaining’ total will be adjusted to allow for your exercise credits. If you would like to see how many calories would have been left without the exercise credit simply hover your mouse pointer over the green ‘remaining’ box. The side menu gives you access to the tools you will use to monitor your overall progress. Update your weight and any other measurements you would like to track. Access the reporting section of the Perfect Diet Tracker to view your results and view progress graphs. You can change your target weight, weight loss and activity level using this option. Make adjustments to your user profile, change your country (useful when on vacation or holiday abroad), change what is displayed in the diary window. 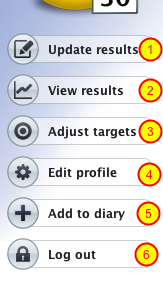 The ‘Add to diary button will bring up a search box so you can add new food or exercise to the diary. If you are using version 3.2.2 or later and have more than one user setup this button will read ‘Switch user’ instead of ‘Add to diary’ to help you quickly switch between different users on your system. You can use the ‘Add’ button directly below the diary or the search box in the top right corner of the window to add new products. Log this user out and return to the login screen. The speed buttons give you quick access to commonly used functions. The add buttons can be used to gain full access the search food and add exercise windows. The group button lets you group items together so they can be added quickly in the future. For example, you may have a common breakfast menu, perhaps a cereal, milk and sugar. You can select these items in the diary, then click on the group icon to group them together. The group will then appear in the favorites (you can also access this using ctrl or command and G on the keyboard). When you add the group all the items in the group will be added to the diary. The edit buttons are useful to duplicate, edit or delete items in the diary. For example you may want to duplicate an entry, then drag and drop it into another meal and finally use the +/- icons to quickly alter the quantity. The notes button with show the ‘day notes’ window. The notes window lets you add notes for each day. To the bottom right of the window you will see a calendar. When you first start the Perfect Diet Tracker this will show the current date. If you select a different date, the diary will be updated to show food and exercise items for your selected date. The text shows how many calories you have left. This box will turn red if you exceed your calorie allowance! In addition at the very bottom of the application window you will see a bar, this bar fills up as you consume your calorie allowance, and like the text above turns red if you exceed your calorie allowance. You should aim to consume all your calories each day. If you are a little under or a little over do not worry. You should not starve yourself in an attempt to lose weight faster, if you are falling short of the recommended calorie intake you may find your metabolism slows down, making it harder to lose weight. If you find you have gone over the recommended calorie intake don’t panic or starve yourself the next day to make up! Simply start again the next day and consume the recommended calorie intake. The title bar of the diary window shows the name of the user currently logged in. Is it possible to show the SUGAR level on the diary screen as a COLUMN similar to the fat, carbohydrate etc? Im afraid this is not possible in the current (v3.2) release, the sugars are shown as a summary / total. We will see if we can integrate this into an update. It would be nice if the system defaulted to entry in the order that the meals are in. For example, when entering something for a new day, the first entry defaults to the previous days meal entry (usually ‘dinner’). Small thing I know, but Mac users expect attention to fine detail. Finally, the ability to log meals by date/time would be useful, since meals don’t always fall into nice timezones. We have tried a few variations for the auto meal selection, and it has been quite tricky getting a set of rules that everyone can work with. The way the auto meal selection system works at the moment is..
1. If the food HAS NOT been added before it will be added to the currently selected meal. If a meal is not selected in the diary it will be added to the first meal in the meal list, or a series of ‘smart rules’ applied based on the item being added to try to add the food to the most likely meal. 2. If a food HAS been added before, the software will check to see if it has been added to your currently selected meal in the past. If it has it will be added to that meal. If not, it will put the food item in the meal you have added it to the most historically. As an example, if you added your breakfast but then added ‘chicken breast’, an item you had added to ‘Dinner’ in the past but never to breakfast, the software would put it in Dinner. You can then of course move it to any meal you want using right click. This feature tends to get better with time as the software learns which meals you eat your most popular items in the most. If anyone has any suggestions as to how these rules may be improved let us know so we can look into this as we would like to make it as perfect as possible. As for timed entries, we will see if this is something we can add to the database and include as a ‘sort by time’ in addition to the group by meal option. It is not in the current roadmap, but should be something we can get into the software. In the meantime you could set up additional meal names for each hour of the day and use these to group items by the time of day. Just started, the first thing I wanted to do was add yesterdays meals. I cannot find a way to designate lunch or dinner meals. To move between days simply click the small <> arrows to the left of the date. The date will then change and the diary will be updated with the meals for the selected date. Alternatively you can jump to any day using the calendar at the bottom left of the window. To quickly copy entries between days, select the items you want to copy across then right click (or hold down ctrl while clicking on a mac). This will give you the option to copy the entries to the current day, use copy and paste to copy them to any other day, and a few more options such as copy entires to other users or create a group from the selected entries. Right click also gives you the option to change an items meal. The last column of the daily page shows totals e.g. Sugar 120.6+ What does the plus sign indicate? 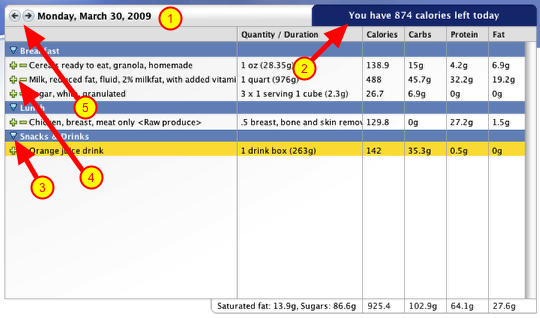 The plus sign is added where one or more products in the diary does not contain data for the sugar content. The total for the known products is displayed, followed by a ‘+’ to indicate their may be additional unaccounted sugar. If you hover your mouse over the +, the tool tip should appear to let you know which product does not have the sugar data so you can choose to edit the product and add the information if required. I think it would be awesome to add the (probably rather complicated) feature of doing a weekly tally of calories (ala Weight Watchers). That way you can “save up” for special occasions, and use the calories for one evening out. Or another example might be to exercise for a half hour more a day so that you could splurge on the weekend and still lose weight. Weight Watchers (which I am not a fan of, because of the point system) seems to be the only program that utilizes this type of feature. Would you consider something like that? Absolutely Jen, that sounds like a great idea, we will see what we can do, Im sure we can add some form on calendar that can show calories and targets day by day, and tallied for the week, month etc. 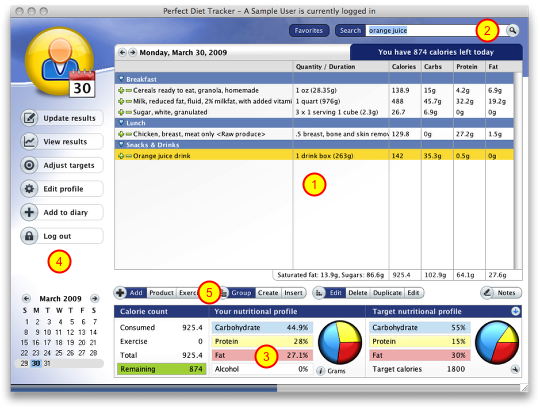 You can add your own products to the Perfect Diet Tracker. If you search for the food first to make sure it is not already in the database, then click on the ‘Add Product’ link just under the list of results, you can add the details of your own product there.